After a fire, accident, storm, water or mold damages your business, you may feel overwhelmed and unsure of what steps to take next. American Restoration has the manpower and capabilities to provide immediate response 24/7. As specialists in fire, water, storm and environmental disaster, we will handle your disaster situation, small or large, while working closely with your insurance agent and/or adjuster to mitigate damage. If needed, we will restore your property back to normal conditions minimizing business interruption, expense and time. Our restoration services always include respectful handling of your property. We treat the contents of your office as if they were our own, from your furniture and equipment to your important documents and files. We are centrally located in Shelby, NC but service the areas of Greater Charlotte, NC and surrounding areas in North Carolina and South Carolina. Our technicians are licensed in NC and SC for disaster cleanup, repair and reconstruction for commercial properties in Gastonia, Kings Mountain, Gaffney, Shelby, Rutherfordton, Forest City, Belmont, Lincolnton and surrounding towns. Restoring your business after fire damage can be a large, sometimes daunting task. Even with the fire extinguished, possible water residue from the fire department, soot and smoke remain. If not dealt with quickly, these issues can do more damage to your office, making it important to call American Restoration Disaster Specialist as soon as a disaster occurs. After evaluating your property, our professional team of disaster specialists can quickly design a plan of action for your business which includes removing debris, water, soot, and smoke before rebuilding your space with complete structural restoration. A large part of our restoration services include moving the contents of your offices to a separate secure location for cleaning and inventory. Doing so ensures that your items are completely restored and untouched by soot. Even when space is clean and restored from a fire, smoke odor can remain. We make sure all odor is removed from furniture, carpet and even your HVAC/air ducts so that you return to your facility worry free. When a pump breaks, a water heater ruptures, a toilet overflows, a pipe breaks, an icemaker line leaks; you only have a short amount of time to clean up the water before it begins to permanently damage your floors, carpets, furniture, walls, and ceilings. Using the latest tools and technology, we work to dry, dehumidify, deodorize, and disinfect your office with minimal disruption to your business operations. After evaluating the initial damage of your property we begin our infrared camera leak and moisture identification process which detects the full extent of moisture damage both obvious and unseen. We then design a plan of action to remove all water and moisture from your space. The cleanup and restoration process involves first extracting any excess water, which mitigates the water damage process. Then, using the latest tools and techniques we eliminate any moisture with our structural drying and dehumidification techniques, carpet and injection hardwood floor drying. In addition to removing water, we work to deodorize and disinfect all surfaces in your office space, stopping mold and bacteria before it can start. We also dry and restore important documents damaged so that you can get back to work as quickly as possible. 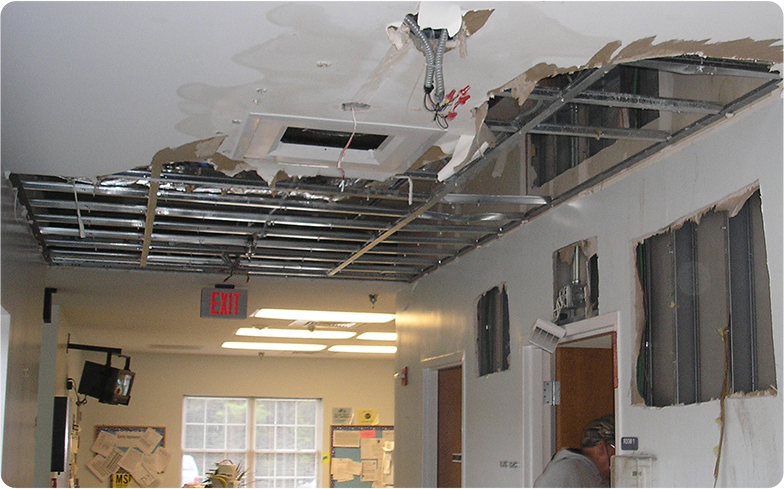 Regardless of the cause of damage, our professionals are able to perform any repairs and restorations to your facility. The effects of hail, high winds, ice, lightning, tornadoes, and hurricanes can cause severe damage to your business and can quickly upset your business operations. We understand your sense of urgency to return to work as quickly as possible and work hard to ensure that it does. The moment your facility is threatened by an oncoming storm, call our 24-hour service, we provide emergency board up and tarping for all business owners. Any properties damaged by wind and storm receive our complete structural and content restoration services. From damaged siding, roofing, shingles and windows to doors, landscape, concrete, and all office equipment, we work hard the return of your office in pristine condition. We are dedicated to restoring your office and business operations and won’t leave until you are completely satisfied with the finished product. Mold develops where there is excess water and moisture over a period of time. Cleaning with bleach and water is not a solution, and more than likely, will not remove the mold and mildew in your office. Using the latest technology in mold remediation, we accurately diagnose the damage to your business facility and mitigate the growth process while sanitizing your space. After evaluating your office, our professional team of technicians locate the source of mold and determine if any reconstruction is necessary, if any water damage has occurred and what is the best plan of action to restore your space. Using our extensive mold removal process, your facilities are then cleared of any mold or mold residue before our team sanitizes and cleanses the area of mold odor with time-tested deodorization techniques. When a biohazard occurs at your business, you need a professional team that you can trust to handle your specific cleanup needs. American Restoration’s team is trained to treat the damage in your office with experience and skill but most importantly, compassion and respect. We arrive onsite with safety equipment, cleaning products and disposal supplies to transform your space back to working condition. What if you showed up to work and found standing water in your office, a tree through your operations facility or soot damage from a fire? The majority of business owners, or their employees, panic when faced with events that interrupt their ability to conduct business. We offer an Emergency Response Program for business owners to put a plan in place before a disaster occurs. Through our Emergency Response Program, we work with you to assist and establish an emergency disaster plan of action for your business. This plan of action helps all parties prepare for a quick response to your business during an emergency, mitigating the loss and protecting the property from further damage if a disaster should occur. As an ERP client, you receive top priority should a disaster occur. We can easily pull your businesses emergency profile, which has been created electronically and safely stored, and begin mitigation immediately. Don’t wait until a disaster strikes to have a plan! Call us today and sign up as an ERP client. Our containment system has a sound attenuating foam core which reduces renovation noise by up to 50%. It exceeds the requirements of ICRA Class IV, and the panels have been tested and are listed for ASTM E-84 Class A performance for fire and smoke. The real wall appearance of the system means that construction eyesores are hidden, and the system is designed for fast and easy installation. As an added bonus, the panels can be easily disinfected. Our HAZMAT Bio Team responded to this call. They sectioned the carcass into pieces,placed it into biohazard body bags, and disposed of it in a certified landfill per EPA guidelines. The American Restoration team worked several nights from Midnight to 7am, to minimize interference with normal operations, in order to clean the smoke and soot from the building. Using scissor lifts, our team was able to reach the ceiling and beams to clean off all traces of soot. 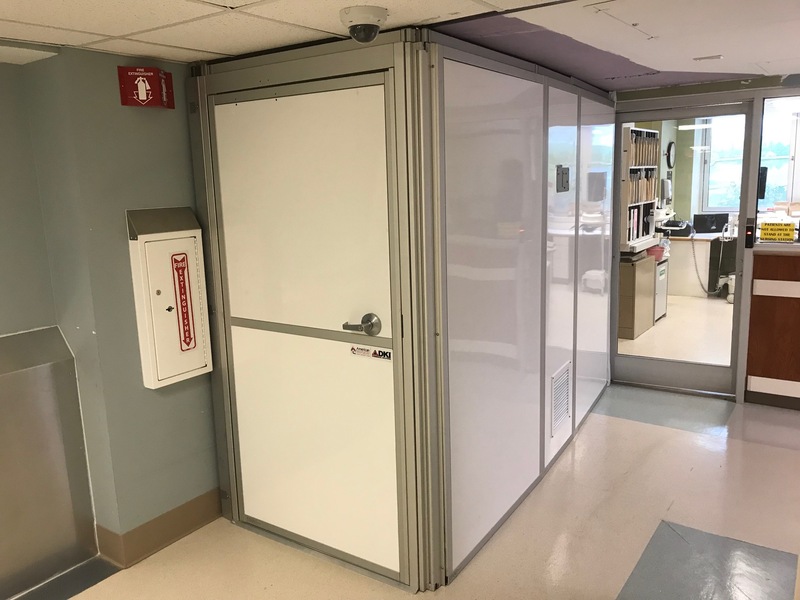 Our team was able to complete the job in less than a week, helping the client get back up and running as soon as possible.